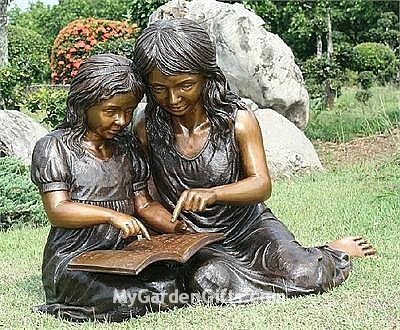 A young mother makes her time to read to her child highlighting to her the value of reading in this beautiful reading sculpture for the garden. Created from bronze, the sculpture highlights the attentive little girl listening to everything her mother reads to her, a sure winner for a mother's birthday! Normally ships in 12-16 weeks. This sculpture is made on order. 50% nonrefundable deposit to commence production on this statue. If you need more information, please email us - we can see if other alternatives exist to this statue if you are not able to wait.